Elliptical. Length: 1 3"; 2 2-5/8". Total weight of 3 = 2 troy ounces. 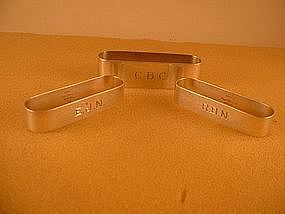 Large one monogrammed C.B.C. ; small ones monogrammed R.B.N. and E.J.N. (monograms could be removed). Mark and overall condition are excellent.